Paving the way to a new era of fast, affordable and quiet aviation is no small task. To us, it’s not just about getting people from point A to point B; it’s about getting you there door-to-door, origin to destination, in the most cost-efficient, energy-efficient, time-efficient, noise-minimizing and comfortable way possible. We pushed ourselves to challenge conventional wisdom, pushing the limits of engineering and technology to produce an elegant, breakthrough aircraft design that delivers efficiency and performance without compromise. One of the keys to delivering this new breed of travel is a radically different air network from the concentrated airliners and hubs of today. Leveraging an arsenal of thousands of dormant secondary community airports, we’ll be able to circumvent the traffic, congestion and time wasted on the ground, moving instead toward an experience that’s similar to boarding a bus or train. That means getting to destinations 2 to 4 times faster at half the cost…and in a quiet, green aircraft. The best part about this network: it doesn’t require much to get it up and running. Our aircraft have low runway requirements for takeoff and landing, and while the airports would require facilities for the recharge or swap of battery packs, the massive roll-out underway to support electric ground vehicles is already paving the way. A major upgrade of air traffic control systems that is already in progress supports a distributed electric air network: NextGen in the US, Single European Skies in Europe, and OneSky in Australia are all due to be live by 2023. These use GPS satellites and onboard ADS-B transmitters to allow for high density flights, reduction in air traffic control workload, and all-weather flights to secondary airports without requiring instrument landing systems on the ground. We knew that in order for our aircraft to transform regional travel, we had to design for unbeatable economics and door-to-door times. And that’s just what we did. The energy-sipping hybrid architecture, ultra-low maintenance powertrain, plug-in charge depleting operation, short runways, fast climb and descent, optimal cruise speeds — all result in unparalleled performance from a cost-time standpoint. We thought about the future, too: our modular airframe design doesn’t tie us to any technology, future-proofing the aircraft over the 20-year life of the airframe, and allowing us to onboard new technologies as they emerge. The traveler experience is just as integral to our overall aircraft design as performance. The spacious pressurized cabin is engineered to facilitate quick walk-on/walk-off transit, and the aft-mounted propulsors ensure a quiet and comfortable flight. With frequent service from nearby airfields, flights will be quick, convenient, and painless. Our series hybrid powertrain was designed for an eventual transition to fully electric, without requiring any mechanical retrofitting. Designing with batteries at 12 to 20% of total weight, we’ve future-proofed our aircraft for 15 to 20 years, enabling us to embrace future technologies and fly faster over time. Our batteries and range extenders are sized specifically for regional distances, with an optimized system that balances the depletion of batteries and use of range-extenders in-flight. We’ve designed aircraft for various flight scenarios, each capitalizing on the most efficient configuration of resources for the demands of the flight. We deliver unmatched safety through a left-right distribution carefully architected to balance power in real-time, by building a reconfigurable distribution system that is resistant to faults and sizing power sources optimized for safe flight. Our propulsors combine range-optimized quiet fans with integrated fault-tolerant electric motors and controllers. These innovative units overcome a long-term challenge faced by carriers: the absence of competitive propulsion for regional aircraft. Our low-pressure fans deliver exceptional efficiency, sport variable pitch for strong off-cruise performance, and feature regenerative braking to replace noisy spoilers. Meanwhile, 40% shorter runway requirements, 75% lower community noise, and highly responsive power without altitude lapse are key to door-to-door times. The beauty of our wings lie in their simplicity. Without the need to carry jet fuel, our wings are able to achieve aerodynamic nirvana with a simple composite box and skin. Inside, we’ve created bays for modular battery packs that are designed for easy removal, which means that we can tailor the battery storage to the requirements of a particular flight. The structurally optimized wings leverage freestream for lightweight cooling and boast a low cost and weight. 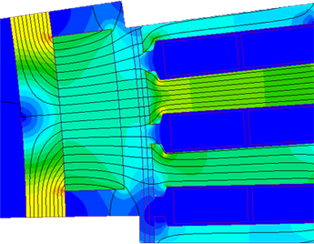 The standardized wing-integrated battery bays are chemistry-agnostic and the fuselage is pre-wired for the eventual transition to fully-electric. Intelligent, real-time and safe. Those are the three components of our optimization and control platform that help us to drive truly disruptive economics for our aircraft. 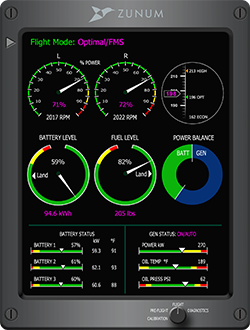 Providing flight energy optimization, real-time power management, fault detection and recovery, the platform determines the optimal energy usage plan for each flight, and queries the aircraft’s energy sources in air, maximizing the use of battery power over the course of the charge-balanced flight. The platform was designed to minimize the pilot training required, so displays and controls are intuitive and reminiscent of conventional aircraft. 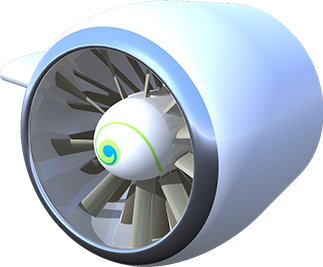 Assisted control of multiple propulsors, make flight operation simple across scenarios. 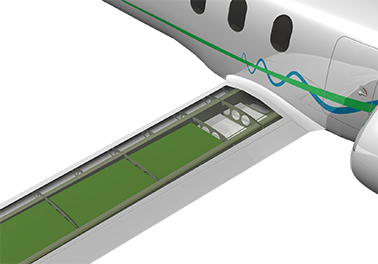 Fault-tolerant capabilities detect and identify faults and reconfigure powertrain and controllers mid-flight. Like the rest of the aircraft, the platform architecture is fully prepared to smoothly transition from hybrid to fully electric.